Reading and share top 101 famous quotes and sayings about Sponge by famous authors and people. Browse top 101 famous quotes and sayings about Sponge by most favorite authors. 1. "From a distance I finally see, I completely understand, As I move forward to take my second step, Followed by a third step, Oh! You are easy to love like a sponge." 2. 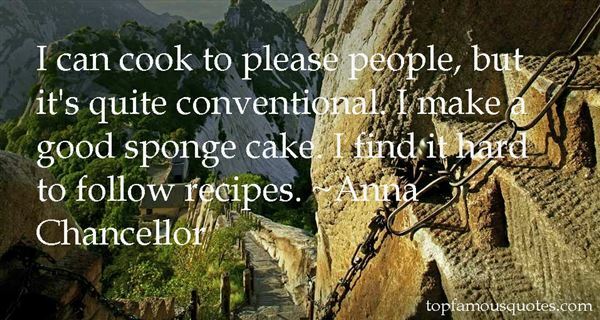 "I can cook to please people, but it's quite conventional. I make a good sponge cake. I find it hard to follow recipes." 3. "Children are sponges, soaking up every verbal and nonverbal interaction." 4. "[Reverend James] Dobson says that the [Spongebob Squarepants] video would be watched by millions of elementary school students and includes a reference to being 'tolerant of differences.' The nerve! Who does Spongebob think he is? Jesus Christ? Tolerance will not be, uh, tolerated. Oh, and tolerance is quite possibly closesly connected to gay-ance." 5. "They say kids are like sponges because they observe everything. I guess that makes teens and adults like mops because they're just as copycatish as kids are. Personally, I am more like a rake, I leave behind more than I pick up!" 6. "He felt like an old sponge steeped in paraffin and left in the sun to dry." 7. "My brain never turns off of songwriting. Every conversation, everything I see, I'm just kind of like a sponge and I soak it up." 8. "Mrs Forrester ... sat in state, pretending not to know what cakes were sent up, though she knew, and we knew, and she knew that we knew, and we knew that she knew that we knew, she had been busy all the morning making tea-bread and sponge-cakes." 9. "Charity felt crumpled and wrung out after her cry, like a sponge that had gone through a week of dishes. Of course Lady Beddington said things would be better in the morning, after a good night's sleep. Charity found it was a struggle to believe her; but then it was a struggle just keeping her eyes open. By the time the guest room was ready, Charity was sprawled out face-downwards on the sofa, sound asleep, her tears already forgotten. And that's what it means to be young, Lady Beddington thought, smiling." 10. "THE BRAIN. The brain is wider than the sky, For, put them side by side, The one the other will include With ease, and you beside. 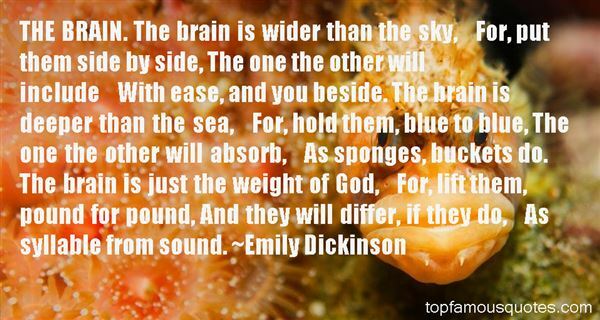 The brain is deeper than the sea, For, hold them, blue to blue, The one the other will absorb, As sponges, buckets do. The brain is just the weight of God, For, lift them, pound for pound, And they will differ, if they do, As syllable from sound." 11. "Childhood is a time for pretending and trying on maturity to see if it fits or hangs baggy, tastes good or bitter, smells nice or fills your lungs with smoke that makes you cough. It's sharing licks on the same sucker with your best friend before you discover germs. It's not knowing how much a house cost, and caring less. It's going to bed in the summer with dirty feet on clean sheets. It's thinking anyone over fifteen is 'ancient'. It's absorbing ideas, knowledge, and people like a giant sponge. Childhood is where 'competition' is a baseball game and 'responsibility' is a paper route." 12. "If I was a cake, I would be incomplete unless I was a yellow sponge from Asia; frosted with brown chocolate from Americas; classy and elegant decorated with fresh white cream from Europe, and satin black fondant from Africa. I would be edible only if cooled in the Antarctica and served at a beach in Australia. No race in this world is superior to another but rather deficient without the other. Tolerance is not love but a chance to abolish any opportunity for hatred. Let's keep baking in a joyful and tolerant manner." 13. "I didn't have years. But I am a quick learner and was in human-sponge mode. I demonstrated." 14. 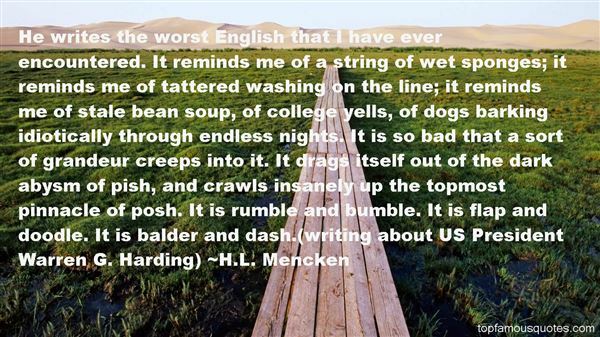 "He writes the worst English that I have ever encountered. It reminds me of a string of wet sponges; it reminds me of tattered washing on the line; it reminds me of stale bean soup, of college yells, of dogs barking idiotically through endless nights. It is so bad that a sort of grandeur creeps into it. It drags itself out of the dark abysm of pish, and crawls insanely up the topmost pinnacle of posh. It is rumble and bumble. It is flap and doodle. It is balder and dash. (writing about US President Warren G. Harding)"
15. "Flames from the lips may be produced by holding in the mouth a sponge saturated with the purest gasoline." 16. "I had to grow foul with knowledge, realize the futility of everything; smash everything, grow desperate, then humble, then sponge myself off the slate, as it were, in order to recover my authenticity. I had to arrive at the brink and then take a leap in the dark." 17. "Her sponge cakes had the aroma of crucifixion.Within them was the sap of slyness and the fragrant frenzy of the Vatican." 18. "I think we're dating now" "Come on...I got you naked. You wore a damn corset. And don't get me started on the sponge bath afterward." 19. "Elves, pixies, gnomes- the Moomins, Chorlton and the Wheelies, SpongeBob SquarePants- they all tried to invade you at some point." 20. "I think one probably absorbs things like a sponge and things emerge without your always being aware of it." 21. "I try to be like a sponge when I'm around other actors, picking things up about the way they work and how they do things." 22. "Written by a sponge dipped in warm milk and sprinkled with sugar." 23. "The tide goes out imperceptibly. The boulders show and seem to rise up and the ocean recedes leaving little pools, leaving wet weed and moss and sponge, iridescence and brown and blue and China red. On the bottoms lie the incredible refuse of the sea, shells broken and chipped and bits of skeleton, claws, the whole sea bottom a fantastic cemetery on which the living scamper and scramble." 24. "... I looked through the car's rear window for a final wave, and it felt like someone had invaded my chest and squeezed all the juice out of my heart until it was a tiny dry sponge." 25. "I sincerely think that Connor is asexual. Like a sponge. He probably wouldn't even notice if you hit on him." 26. "Human, you are a machine, an organism, an animal, a primate, an artist, an athlete, a thinker, a sponge, a spirit, a comedian, a connoisseur, a cycle of breath in and breath out, an inventor, an expressor, an orator, a lover, an explorer, a creator, evolved. Your mind paints the flowers and the sky using the mind's eye as a paintbrush and light as paint. Splashing life across the blank canvas of reality. That's what you do. Every moment of every day." 27. "It was all very strange, Mr. Gray thought, as he wiped the coffee canister clean with a sponge. Very, very mysterious. You were born; you lived a whole life; and at the end, you wound up in a coffee canister. "Ah, well," he said out loud quietly. "That's just the way things are. Life's a funny business." Death, he supposed, was the punch line." 28. "A sponge sees everything? A sponge sees nothing." 29. "What, you didn't pack your lunch?" Ty asked sarcastically as he shifted around in the seat and wedged himself against the door. He kicked a foot up and propped it on the console between the two front seats. "Sure, in my SpongeBob SquarePants lunch box. I have the thermos, too," Morrison shot right back. Zane kept his mouth shut, eyes moving between the two men, and occasionally back to the driver, who was casually paying attention. Ty stared at the kid and narrowed his eyes further. "Spongewhat?" he asked flatly. Zane didn't even try to hold back the chuckle when Morrison looked at Ty like he'd lost his mind. "Spongewha … you're yanking my chain, aren't you?" Morrison said. "Henny, he's yanking my chain." "Yeah, well, that's what you getting for waving it in his face," the driver answered reasonably. "What the hell is a SpongeBob?" Ty asked Zane quietly in the backseat." 30. "Eventually I confess to a friend some details about my weeping—its intensity, its frequency. She says (kindly) that she thinks we sometimes weep in front of a mirror not to inflame self-pity, but because we want to feel witnessed in our despair. (Can a reflection be a witness? Can one pass oneself the sponge wet with vinegar from a reed?)" 31. "A lot of the time writers are just sponges... for what's around them, and so books are helpful for focusing your mind and literally putting it into words." 32. "Her body feels different, no longer taut and sinewy but sponge-like fluid. Saturated. It has a different energy, a deep orangy-like pink, like the inside of a hibiscus." 33. "Like a White Russian drinking tea in Paris, marooned in the twentieth century, I wander back, try to regain hose distant pathways; I become too maudlin, lose myself. Weep...I sit in the chair and ooze like a sponge." 34. "People don't tend to employ me. I'm the wrong personality type. Or rather, people do tend to employ me for a short time and then they sack me. A film broker once told me, as she terminated my contract, that I have a misleading sort of face. "You're pretty", she complained. "Your features are symmetrical and there was an article in Grazia that says human beings are programmed to find those with symmetrical features more pleasing to they eye. So this isn't my fault, I was simply responding to a biological imperative. You've even teeth, so when you smile, you look...sweet, I suppose. But you're not, are you? ""I hope not," I said. "You see, there you go again. You're a smart-arse and you've no ability to filter your thoughts---""And my thoughts are often abrasive.""Exactly. ""I'll just get my brushes and sponges and leave. ""If you would." 35. "The women are young, young, young, liquidy and sweet-looking; they are batter, and I am the sponge cake they don't know they'll become. I stand here, a lone loaf, stuck to the pan." 36. "Don't pretend to know everything. I've been blessed to work with a lot of veteran actors, and I soak up lessons from them like a sponge." 37. "I do like a lot of things that a lot of adults would scoff at. 'SpongeBob SquarePants,' 'Looney Tunes.'" 38. "Tears will not fill your stomach; Tears will not bring kindness. If you have time to shed tears, laugh; someone will be willing to look at a hearty smile more then a tear soaked sponge." 39. "Whenever Elliot Norther's wife was nervous she baked. With the murder of Harriet Mason, her husband's close colleague at the Faculty, she had been unable to resist a couple of Victoria sponges. During the frenzied press speculation about the identity of the murderer, a Dundee cake had appeared, followed swiftly by a Battenberg and a Lemon Drizzle. Since news of the Wildencrust murder broke, the kitchen, dining room and study had come to resemble the storerooms of an industrial bakery, every surface heaving with the weight of sponge and cream. Yesterday, having at last been overwhelmed by the fear and rumour that swept the town, she had taken herself off to her mother's house in Hampstead, leaving her husband to soldier on alone. When he had last seen his wife, Elliot Norther noticed that she had been putting the finishing touches to an impressive, triple-tiered wedding cake, beating a batch of royal icing into a sickly paste." 40. "Did I mention how cute you look in my clothes? "Blushing I just look at what I'm wearing and laugh. "Chicks Dig me? And Sponge Bob boxers? ""Chicks do dig me! And Sponge Bob is a great cartoon in your world." 41. "I wumbo, you wumbo, he she, wumboing"-spongebob"
42. "Be skeptical about this one. It's a great book. But try to be a filter, not a sponge." 43. "He could feel the pores of his body open like a million mouths and slurp the water in like a sponge." 44. "I don't like tofu. I'd sooner eat a sponge." 45. "When the girl at the squat got her throat slit, and Jacob got marked, Nix had been in Portland a little under a year. He had just bought a SpongeBob sleeping bag from Goodwill and had started to feel something like safe. But then, a roll or two of dust every other week helped with that." 46. "Is your heart a sponge or a fist?" 47. "Maybe Larry was wrong about the word friend, maybe he'd been shoved away from everybody for so long all he was was a sponge for the wrongs other people did." 48. "Today was the dance contest, the one where Squidward takes over Spongebob's body...During the competition, Squidward gets a cramp and Spongebob's body ends up writhing on the floor in agony. The audience thinks this is pretty cool and gives him First Prize. Quite a metaphor. The person in the most pain wins. Does that mean I get a Blue Ribbon?" 49. "An Underground that knew all about this, knew all about Les, was preparing to wake up the world and invite it to a Canada's Wonderland made of bodies. Giant bloodslides. Houses of torture where children's kidneys are twisted like sponges in the fat hands of musclemen. There would be buns crammed with the cooked knuckles of teenagers, and a king, sitting on a mountain of kings, eating his own shoulder." 50. "All has happened to her that will happen to her. She has felt everything, borne everything, experienced everything, suffered everything, lost everything, mourned everything. She is resigned, with that resignation which resembles indifference, as death resembles sleep. She no longer avoids anything. Let all the clouds fall upon her, and all the ocean sweep over her! What matters it to her? She is a sponge that is soaked." Sensitive, humbug. Everybody thinks I'm sensitive. Wait until they hear my new album."